Late one night in very late 1976, a singer acquaintance of mine burst into the (condemned) house I was then sharing with the local bar band, shouting "You will NEVER believe what I just saw in Toronto tonight! These four guys with Brian Jones haircuts wearing drainpipe Levis, singing all these really fast, short songs. LOTS of em, too! And the best part? NO GUITAR SOLOS!" Now, this being the absolute height of "Frampton Comes Alive," it's hard to completely fathom today the socio-musical import of that final kernel of information. 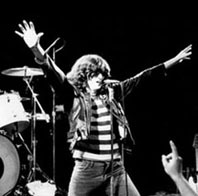 But of course I was hooked, and the next time the Ramones landed in Canada, I made sure I was there. The Dead Boys were opening: Sure, Stiv was alotta fun crawling over and across the drumkit during "Hey Little Girl" I suppose, but the headliners truly were, in every aspect of the words, The Real Thing. So I duly invited myself backstage to conduct their first interview on Canuck soil, and despite nearly getting bounced for taking a snap of Danny Fields writhing beneath a fridge in search of a runaway pencil, I was made to feel totally at home by the band's deep-rooted, deep-seeded LOVE of all things Rock and especially Roll: Johnny's coming-of-age watching Elvis' Ed Sullivision debut as a child, Dee Dee bemoaning the fact that it was hard getting the band going "coz rehearsal halls wouldn't let us in, ya know," and Joey. Dear, sweet Joey. He asked all about my record collection, claimed Peter Noone and Ronnie Spector as his two primary vocal idols, then wondered where a good place was to go see some local bands play later that night. So we drove the R. brothers straight over to Toronto's Crash and Burn club to see Teenage Head throttle some old Eddie Cochran and Swinging Blue Jeans tunes, ran into Phil Lynott somehow lurking by the bar, then we all went out for some classic Canadian pizza slices (...mainly crust 'n' cheese, Tommy was complaining). Through it all, and then during subsequent fleetful meetings, Joey remained every inch the diehard, gentle man FAN of Our Music, and despite the fact that he and his bandmates literally Changed The World, I simply prefer to remember the man instead as nothing but the tallest, and needless to say COOLEST Herman's Hermits fan I ever did meet.